When it comes to automating warehouse and logistics operations, there are still numerous perceived barriers standing in the way of progress, something Viastor Systems has explored in its recently published report ‘Warehouse Automation Debunked’, which seeks to address some of the most common myths about warehouse automation. Level 1: Conventional picking with productivity and accuracy improvements delivered via warehouse management system (WMS), radio-frequency (RF) or voice-directed picking, and/or a labour management system (LMS). Level 2: Mechanised solutions that automate horizontal movement and reduce staffing, such as conveyor, pick modules, stretch wrap applicators, label print-and-apply, and layer picking equipment. 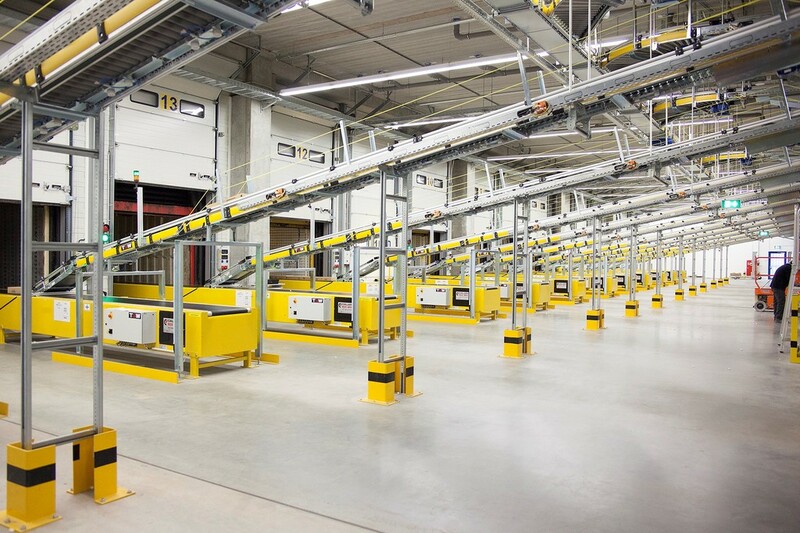 Level 3: Semi-automated installations that boost storage efficiency and minimise travel and manual handling operations with automated storage and retrieval systems (AS/RS), conveyor and sortation, and warehouse control software (WCS) to direct equipment operation in line with the WMS. Level 4: Fully-automated, high-speed (and yes, potentially “lights out”), greenfield installations that include a combination of high-density AS/RS, extensive conveyor and sortation, automated layer picking, case palletising, WCS and WMS. Another argument often cited against warehouse automation is the level of investment required and long return on investment periods. 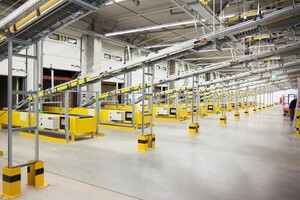 According to Viastor, depending on the type of automated system installed—and the specific circumstances surrounding a facility’s current mode of operation— an investment in automated material handling systems and technologies could take as little as 6 months to as long as 10 years for an effective ROI. In fact, in direct contrast to concerns about being able to afford automation, there is now a school of thought that many operations simply can’t afford not to automate if they are to remain competitive. One company to have embraced this attitude is rapidly expanding online clothing retailer ASOS, whose Barnsley warehouse fulfils orders for customers all over the world - amounting to thousands each day being selected from the 80,000 lines and 13.1 million items held. Expanding while servicing the needs of millions of customers and maintaining margins is a tough challenge, so the project delivery team, led by supply chain director, Mark Holland, came up with an ambitious plan – automation coupled with expansion. In its first year of operation, it has significantly lowered costs and is on its way to paying back the investment. “At ASOS, we see logistics as a competitive advantage that enables us to disrupt the market,” says Holland, “and automation was at the heart of our solution. That didn’t mean replacing people with machines, but enabling them to work faster and smarter. Under the old system, colleagues fulfilled orders by walking around the five levels of the warehouse to collect each item. 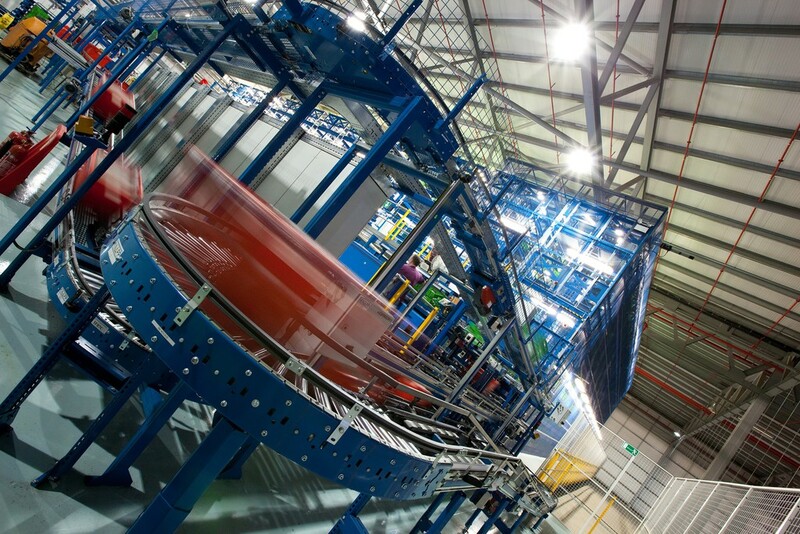 Another online retailer to embrace warehouse automation, this time in the groceries sector, is Ocado, which is benefitting from a wireless control system, which allows it to co-ordinate the movements of hundreds of thousands of crates in real time and in parallel. Designed and developed by Cambridge Consultants, the technology means that Ocado’s next-generation warehouse is home to the most densely packed mobile network in the world. The challenge is said to be on the scale of attempting to control the movements of all the aircraft that fly in and out of London’s Heathrow Airport in a day – but all at the same time and while they’re circling around within a few kilometres of each other. Existing mobile communications technologies did not offer the real-time control or scalability that Ocado needed. The Cambridge Consultants team identified that a system based on 4G telecoms technology deployed in the unlicensed 5GHz Wi-Fi band gave the best chance of achieving Ocado’s goal of co-ordinating thousands of fast-moving machines to within a fraction of a second. 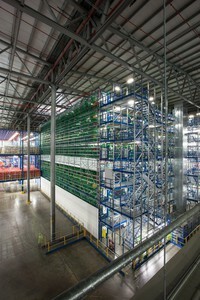 The new wireless control system provides Ocado with a guaranteed connection 10 times a second to each of 1000 machines per access point – all working within a 50-metre radius. 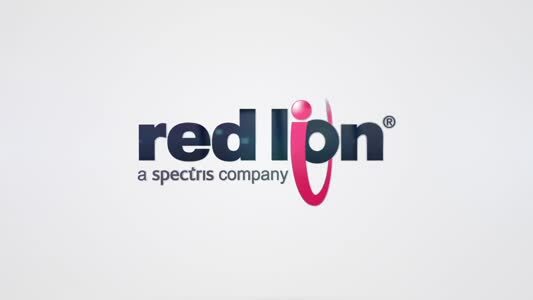 As it works in licence-free spectrum, it can be deployed quickly anywhere in the world. As well as logistics, the system could potentially be used to control fleets of semi-autonomous vehicles at sites such as factories, construction sites and airfields. As a leading multi-channel retailer of specialist and everyday electronics, Conrad Electronic offers more than 700,000 products to customers worldwide. The company serves both its online customers and its 30 European stores from its distribution centre in Wernberg, Germany. With a growing range of products, the distribution centre was bursting at the seams. More space, greater efficiency and a future-proof SAP IT platform with warehouse management system (WMS) and material flow system were needed. 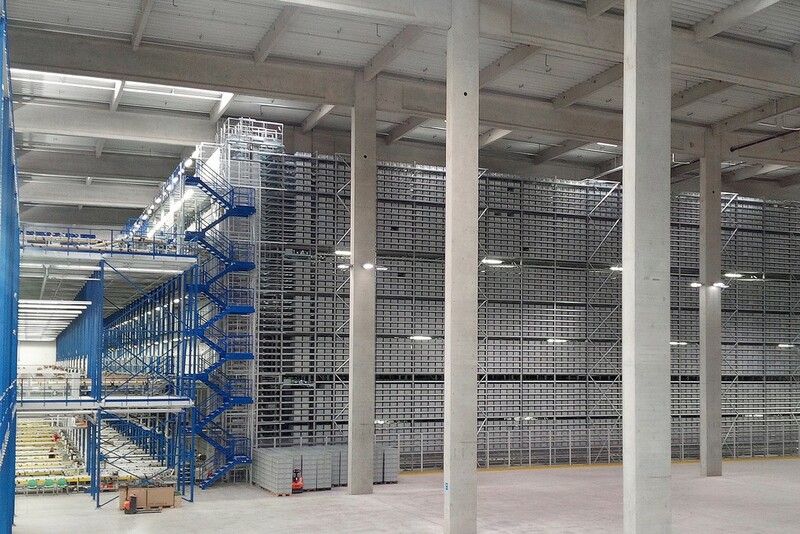 Supported by an automated, efficient and ergonomic logistics system, an expanded internal logistics installation aimed to achieve a higher storage capacity and double the number of shipping packages to 100,000 per day with customer delivery within 24 hours. 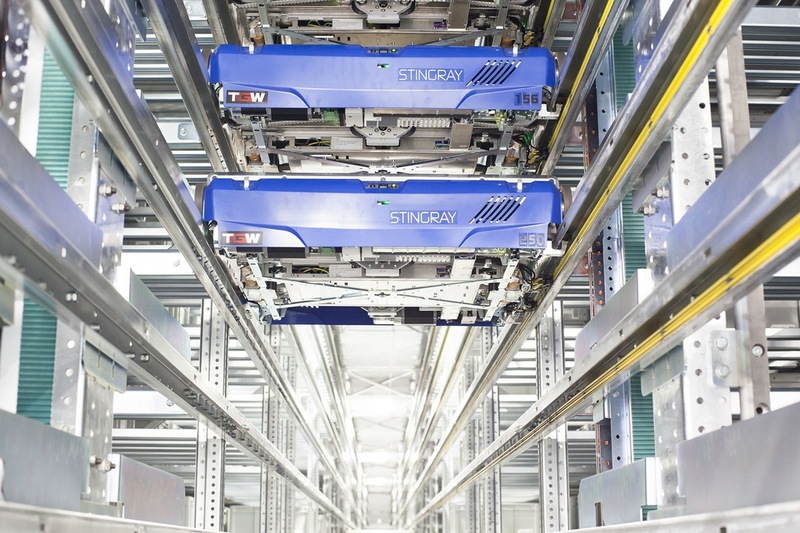 TGW realised a solution consisting of a STINGRAY shuttle warehouse with more than 200,000 storage locations and a performance of 6000 in and 6000 out tote storage and retrieval movements per hour. The process begins with goods arriving at Conrad’s distribution centre, before being transported to a re-packing area consisting of 36 workstations where the goods are put into totes to be safely transported through the facility. Totes are then stored in the TGW STINGRAY shuttle warehouse where 375 shuttles serve three picking levels and 15 Goods-to-Person picking workstations each. 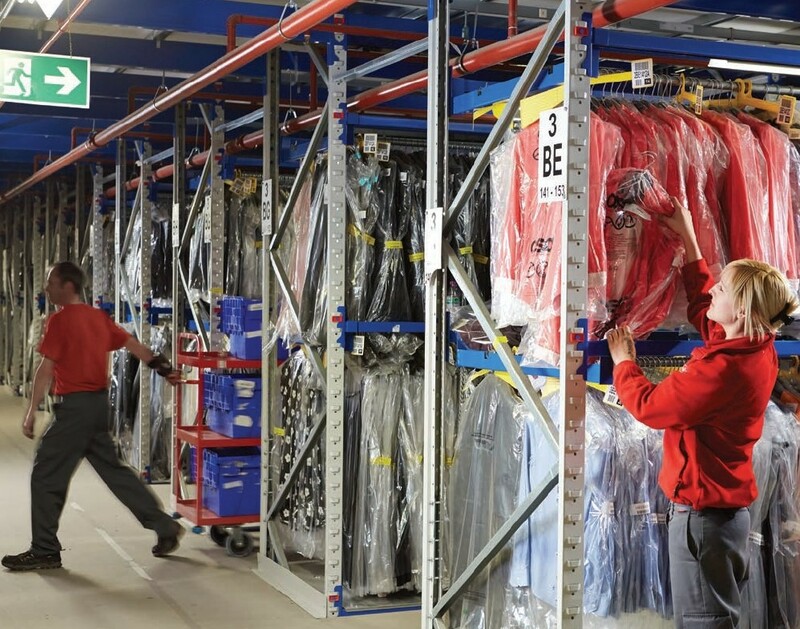 “In the distribution centre, two thirds of our operation serves online customers and the other third our international stores,” said Udo Hermannstädter, head of logistics at Conrad. “This is why 30 workstations are reserved for online orders and the other 15 stations take care of the stores. We wanted to use the existing footprint effectively, which is why we opted for picking operations across three levels. Once the goods have been picked at the picking stations, they are transported to Goods-Out where they are weighed and then checked by a camera system. This is done at one of the 21 Goods-Out checking workstations before the cartons are finally sealed and labelled accordingly. System Logistics designs and produces machines and complete systems for handling goods inside company/production distribution systems. The company’s Modula automatic mobile storage systems with trays streamline work and time management in the picking and tracking of components and semi-processed and finished products. The Modula structure is formed by a frame of bearing sections and modular steel covers; it reduces up to 400m of material into only 12m. The product line consists of different solutions for vertical automatic warehouses depending on client needs. The Modula LIFT is the flagship among vertical warehouse and can store up to 60,000kg. 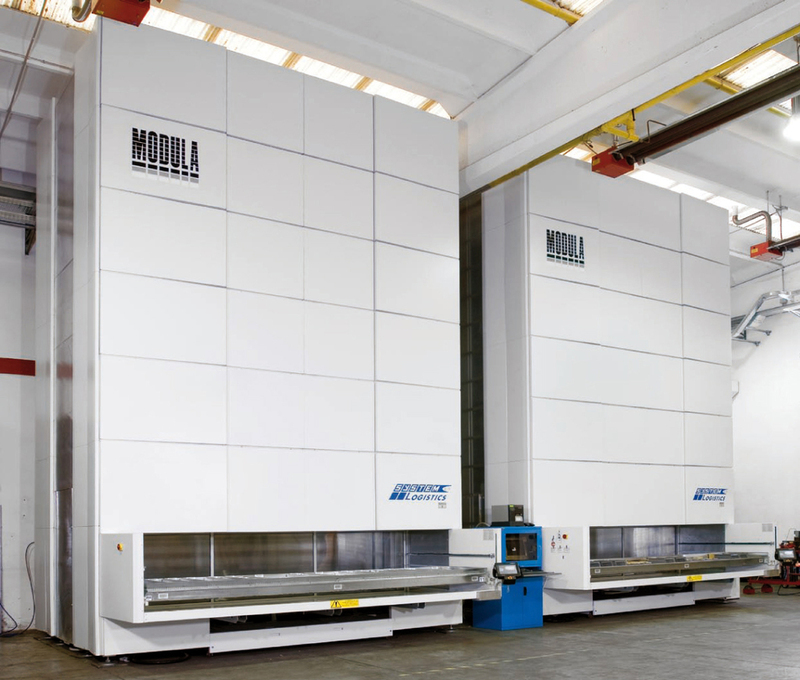 The Modula OneTON is the automatic vertical warehouse with a high loading capacity: 990kg (net) for each tray. Finally, the Module Sintes1 is the ideal warehouse solution for picking for the storage and picking of small parts, thus optimising the available space inside the company and working at top picking speed (115 cycles/hour). 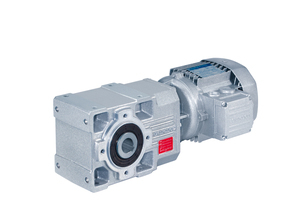 In order to meet all of the complex demands of the machine handling and driving systems as well for the electronic controls of Modula, System Logistics enlisted Bonfiglioli and its diverse range of gear motors and frequency inverters. Modula utilises several of Bonfiglioli´s gear motors, such as the F Series as well as the W/VF and A series. The cornerstone of all these motors is versatility and efficiency; they can also be easily adapted to meet specific needs. They offer a streamlined installation due to lightweight size and offer a wide variety of mounting options and shaft configurations. They are suited for the diverse material handling requirements of Modula's storage solutions and help facilitate the picking and conveying of the various components. 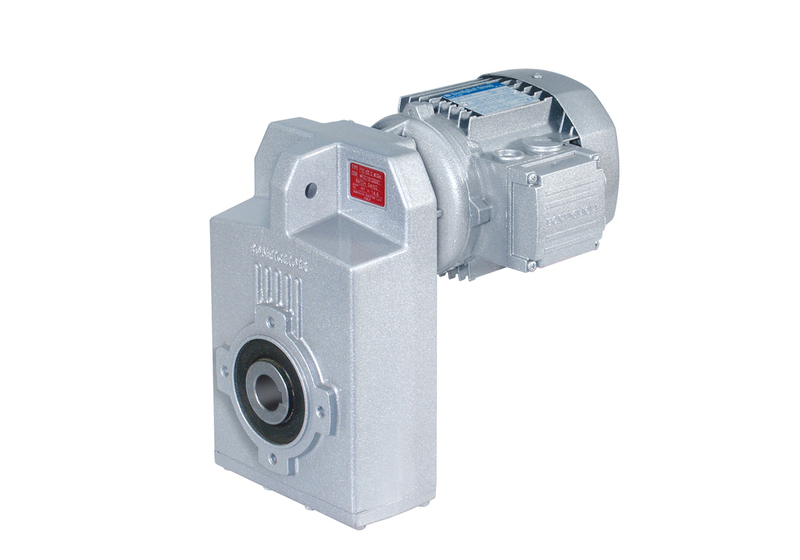 In addition to the various gear motors, Bonfiglioli also provides Modula with different series of frequency inverters, such as Agile and the ACU/AEC Series. The Agile Series is a sensorless vector inverter that boosts the efficiency of Modula's various automatic storage units through open loop vector control, MMC memory cards and web control; it also offers easy installation and quick start-up. The ACU/AEC inverters are a compact and flexible solution dedicated to demanding industrial automation and motion control architecture requirements, which are of paramount importance to Modula for all its picking and tracking operations. The versatile and highly-accurate frequency inverters are crucial for Modula in order to adjust the speed, power and torque requirements based on client specifications. The same inverter commands axis z and axis x. For this particular application, a customised firmware has been implemented, which allows the two axes to use the positioning functionality. By eliminating manual scanning: barcodes are typically scanned by MHE drivers when picking items, however, there is more to this process than a simple read of a barcode. Hidden time-drainers include the manoeuvers involved in being able to scan the code in the first place as well as the time to require to manually operate a hand-held device. This can take up to 15 seconds of additional time per pallet move. While this may not sound like much, it all adds up quickly and equates to four hours of time wasted for every 1,000 pallets moved. By improving inventory accuracy: removing the risk of human error from the pallet moving process provides assurance that inventory locations are always recorded correctly. This eliminates the time spent searching for misplaced items and reduces the amount of effort required for stock reconciliation exercises, such as cycle counting and stock checking. By providing accurate and timely data: an automated system helps to make informed decisions that will result in productivity improvements, such as working out how many forklift trucks and operators are required for each shift.